What do 360 degree video, hip hop artist Desiigner, and ASL Productions have in common? This year is flying by and before you know it Summer will be here. No matter how quickly your days turn into weeks, there is always time to stop and read about all things ASL. ASL New York joined our ASL Los Angeles team at the Barclays Center in Brooklyn to cover the Jordan Brand Classic, a showcase of the best high school basketball players from across the country. While covering the game, we ran into hip hop artist, Desiigner, who reached number one on the Billboard charts with his song, Panda. Take a look at a video clip at the top of this email. For the last few years, ASL has filmed the Vision Monday Summit. This summit brings the top minds in the field of eye care to New York City to learn about new technology and trends in optometry. This year, the event was held at the New York Times Building. Attending the Vision Monday Summit really gave us a lens in to the future of eye care. Our animation work has continued with the IT consulting company, Whitlock. Last month we showed you our Whitlock Service Anywhere video, where the partnership between Whitlock and Hewlett Packard was highlighted. We are working on four more videos for Whitlock, focusing on service intelligence and providing IT management in an instant. The video below is titled Value First. 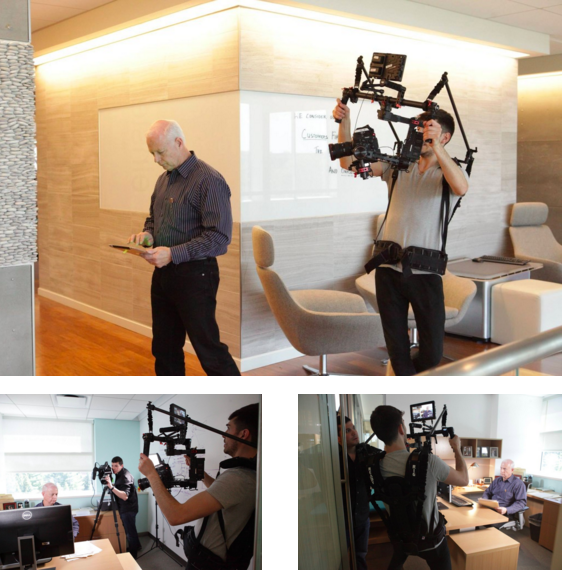 As the month progressed, we found ourselves at the Infragistics offices shooting live action office scenes. We use a steady cam device called a DJI Ronin for a lot of our shoots. The pictures below will show you how our operator has to strap in before shooting can take off. Please don’t hesitate to reach out with any and all production questions, including 360 degree video. We are gearing up for summer and now is the time to contact us for upcoming projects. Email us at contact@ASLProductions.com or get social with the buttons below. Lets bring your vision to life!